Household food and nutrition security in changing socio-economic conditions – Linking research to policies and programmes. 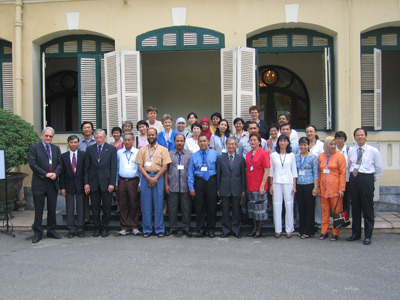 The workshop was held from May 1 to May 6, 2005 in Hanoi, Vietnam. The Workshop was hosted by the National Institute of Nutrition. In Asia and in particular in Southeast Asia nutrition is in a rapid process of transition. Urban areas are characterised by changing food habits, food culture and consumption patterns. Together with nutritional deficiencies in the slums, over nutrition can be found among the emerging middle-income groups. Likewise socio-economic conditions in the rural areas are changing. An increasing number of rural households have insufficient access to land and other resources. Food security at household level as well as malnutrition continue to be of great concern. However, during the last ten years much progress has been made in improving household food security. On the other hand knowledge and insight in socio-economic processes affecting household food security remain scanty. Discuss the linking of research results with policies and programmes. 3. Socio-economic dimensions of nutrition interventions. Researchers and other professionals, supported by the Neys-van Hoogstraten Foundation (NHF), presented a paper about their study or a poster about their research. For abstracts see: Report workshop 2005.